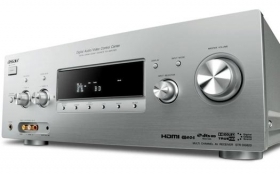 Due to some problems with our previous hifi-set, we decided to buy a brand new home-cinema receiver. I already knew what I wanted, weeks in advance 🙂 So, we bought a Sony STR-DG820 ! I must say, the sound that this beauty produces, sounds more natural, crisp, full, clear and warm, Even with the same speakers we used previously. It does not only do “sound”, but it also does “video”. (which eliminates the need of a video matrix switch) After all, an “investment” that is worth the money !